Please note this kit doesn't include light stands. 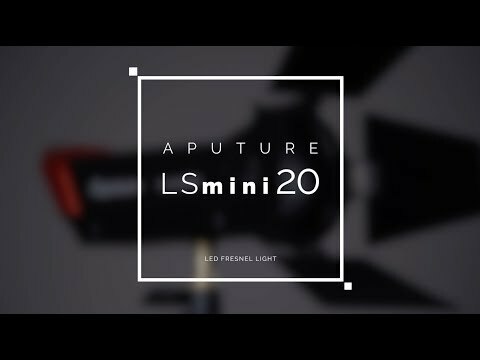 The Aputure LS-mini20 series is the newest addition to an already renowned Light Storm series. However, though it's groundbreaking combination of performance and portability, the LS-mini20 is unlike anything you've ever seen before. The Light Storm LS-mini20 uses the Chip-On-Board design of the Aputure Light Storm series. It features a TLCI & CRI of 96+, which guarantees natural, pristine colour in any application. With a Fresnel built into the front of the light for focusing the light beam, the LS-mini20 is capable of outputting 2000lm using only 25 watts of power and can reach up to 40000 lux at 0.5m away. The Aputure LS-mini20 offers you completely controllable and shapeable light in any situation. In addition to including an ultra-smooth dimmer wheel to change intensity from 20% to 100%, it also has an adjustable beam angle wheel to spot and flood your light anywhere from a 20 to 80-degree cast. Whether you're dealing with shape-based lighting or portrait lighting, the LS-mini20 is the perfect tool to turn your vision into a reality. The LS-mini20 series features two models with two different colour-temperatures: the LS-mini20d (7500 Kelvin) and the LS-mini20c (3200-6500 Kelvin). With two variations of the same great light, your lighting options are more versatile than ever. The LS-mini20 Kit includes 2x LS-mini20d's and 1x LS-mini20c. Each light has a weight of 578g and comes packed with all of the power and colour-changing accessories you'll need. In addition to this, the kit version also includes 3x collapsible Light Stands for easier travel and faster setup. Welcome to the world of easy power. Due to its 5v-18v port, the mini20 supports a wide-range of powering solutions. To list off a few, the light can be charged using an AC-DC adapter or Sony NP-F970 battery. On the lower and higher ends, the light can also be charged using any standard 5v Power Bank or Sony V-Mount battery through D-Tap.